Ed tech company D2L has announced plans to release a major upgrade for its learning management system that is intended to span all of K-12. Aside from its adoption within higher ed, Brightspace traditionally has found a home in high schools. "Brightspace for K-12," as it's being called, will stretch into the elementary grades too, with features that allow young learners to capture evidence of their school activities and simplify the process of teachers communicating with families. According to one educator at a school system that has been testing the software, the new functionality is "going to open up lines of communication" with parents. The interface in the new version is designed like a social media platform, the company reported. The "Activity Feed" acts as a hub on the course home page to enable teachers to communicate with students about reminders, upcoming work, new content and discussions. The interface also provides single-login access to other programs that may be used in class. Those same class updates will be available to parents in a "Brightspace for Parents" portal expected in the fall. For parents who have multiple children in the same school or district, the interface will show icons for each child, simplifying the process of viewing the work and progress of one student and then moving to another. "We've made a lot of improvements for teachers to communicate what is happening with children, so parents or guardians can effectively be a 'fly on the wall' in their child's classroom," said Ken Chapman, vice president of market research at D2L. "Parents want to feel they're aware of everything that's happening." The upgrade will also include "Lessons," which simplifies the job of bringing together digital curriculum from publishers, district-provided content, open educational resources and teacher-developed materials. Users drag and drop content to add, change and arrange it. Then a suggested pacing feature helps them to estimate how the lessons will unfold in their class calendar for fine tuning. D2L said that Lessons will also provide visualizations of how a course's content aligns to learning standards. Teachers will also be able to map their custom content with "a few clicks." Among the content providers working with D2L on Lessons is LearnZillion and the Florida Virtual School, which both produce course materials. According to Chapman, most teachers who use Brightspace are already using other tools such as YouTube, Google Classroom, LearnZillion and Microsoft Office 365 for Education, "and we want them to. We say to them, 'If you've got all of your content and great lessons in Google Classroom, use the tools that you love.' We'll post and centralize those things in a common area." The release will also sport D2L's new "Daylight" interface, which will display content resized appropriately on any type of smart device, whether PC, mobile phone or tablet. The company explained that this feature would allow students who lack large-screen devices or WiFi at home also to be able to access their learning content in a usable manner. But it's the interface for early grade students that is perhaps most innovative. As Chapman described it, each student will get a "little card with a monster face on it." They can place that card next to the activity they've been working on and use a "basic app" on a classroom iPad or other device to take a picture. The system uses the monster card to identify whose work is being photographed. It uploads the material and sends a notification to the teacher who can approve the image to have it automatically moved into the child's portfolio and add commentary or not. The results can then be viewed by the parent in the family portal. "For the students, they have an app where they can take a quick picture and record an audio reflection. For the teacher, they don't have to go catalog and index those things," Chapman explained. The District School Board of Niagara in St. Catharines, Ontario has been using D2L for about seven years. Currently, the school system has about 29,200 users — with about 80 percent adoption rate — and it's growing by 5,000 users a year, said Robert Dunlop, a blended learning resource teacher with a focus on the elementary grades. The Niagara school system has been providing feedback to D2L developers for the new release. What impresses Dunlop most about the software development is that the company is looking at it from a teacher and student perspective. "One of the problems with documentation for teachers is the fact that they have 30 kids — everything is going on at one time. Documenting all those students becomes overwhelming for them. 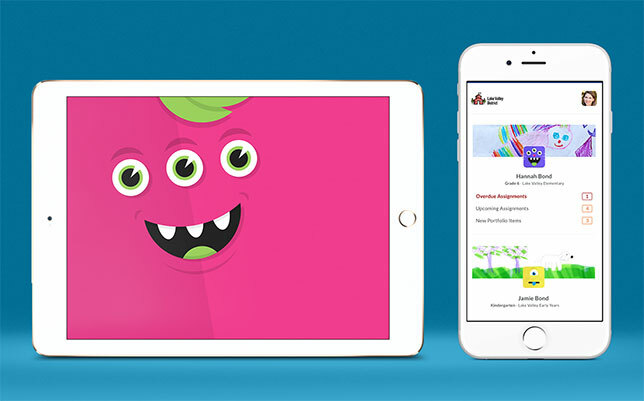 Now they've created a portfolio app that can be used directly by a student in kindergarten." For example, he said, D2L conferred with kindergarten-aged children and gave them iPads, then designed the software around their hand size and hand positioning. "Now the teacher is going to be able to say, 'Hey, go capture that and explain it and put it in your portfolio.' It makes documentation so much more feasible. It's not simply a teacher creating a collection on the student and using it for their report cards. It becomes a little bit more empowering for students to to try to take control of their own learning." He's seen versions of the interface, he added, that are modified to address different age groups, grades K to 3, 4 to 6 and so on. On the high school front, the school system has also seen updates to Brightspace's quizzing tool, communication tools and navigation, according to Jim Reschke, a technology-enabled learning and teaching contact at Niagara with a focus on secondary grades. "Having the ability to post things for students that are missing classes or away on trips so that they can catch up — teachers like that. There's some flexibility there too. The efficiency piece is very big. We hear it over and over: 'My teaching practice has changed since I started using this tool.'" Rosemary Jellinck, the school system's student achievement leader for IT and learning, said she anticipated the district adopting many of the new features when they're released later this year, starting with the portfolio functionality. However, Jellinck noted, the parent portal "piece" will be a "bit more of a challenge, because it does involve sensitive information. We need to make sure our student databases have everything in place in order to communicate with parents. There's going to be a little more work done on that." But she's also persuaded of its value. The parent portal, she asserted, "is going to open up lines of communication and allow parents to really be working side by side with their children. Right now, if a parent wants to see what's going on, they're basically looking over their child's shoulder. By adding this piece, they're going to have their own environment. It'll be a very different experience for parents, which I think will be powerful."